Hatch chiles judged, deemed “disappointing”. 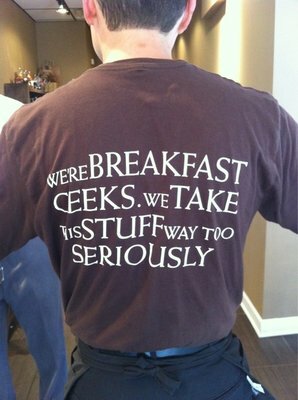 Weekends are when I have time to make a great, hearty breakfast. I had been thinking about these breakfast tacos since I finished the ones from the previous Sunday. Hatch chiles are in season right now and we bought some pre-roasted mild ones at HEB. 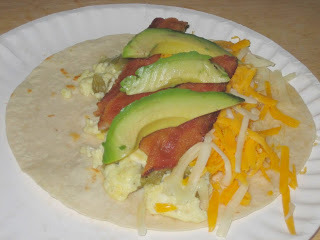 This would be my first bacon, egg, cheese, Hatch chile, and avocado taco. Having never used the chiles before I had no flavor expectations, but considering all the hype they receive I was hoping for a palate changing experience. Unfortunately for the foodie hypesters the result was underwhelming. It is possible the preparation was lacking. After rinsing the skin off and deseeding them I threw them in the skillet with some olive oil and let them sauté for a bit. I did not add any salt, and perhaps that was my mistake. Of course, the taco was very good. It had bacon, cheese, avocado, and egg, how could it not be? I just don't think the chiles added anything to them, kind of like Entourage to HBO. Shred cheese to your desired ratio of yellow to white. Halve avocado, using the half without the pit to make slices. Add a two to three second pour of milk to a bowl with the two eggs. Add black pepper and beat. Start a skillet on medium and add olive oil. Place chopped chiles in skillet once it’s at temperature and let sauté for five minutes (For non Hatch tacos, omit the olive oil and chiles and use cooking spray in the skillet). About one to one and a half minutes before putting eggs in skillet, add a pinch of salt and mix. Put the heat just below medium and then pour eggs into skillet. Mix well with the chiles. Keep watch on eggs to make sure they don’t dry out on the edges. Mix it around with a spatula occasionally. I like my eggs wet so I make sure heat isn’t too high and take them off the heat while they still have a wet look to them on top. Place eggs in tortillas, top with cheese, bacon, and avocado slices, and enjoy. Take a nap in the afternoon. I’m not a chain snob. Many food forums I read, including one that rhymes with “cow pound” have posts from people who seem to feel chains are beneath them, or incapable of serving good food. Of course, these same people will recommend dreck like Maudie’s, Kerbey Lane, Jorge’s, and Enchiladas y Más. If a chain serves food I like, and enjoy, I’m not ashamed of it, and you shouldn’t be either. 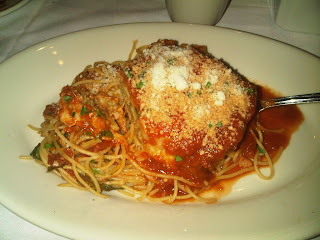 I went to Maggiano’s Little Italy for lunch. It’s a very nice looking restaurant in the Domain right next to Dillards. The interior was much bigger than I thought it would be and it looks like the type of dining room you would find in an expensive hotel. The bar area had a lot of dark word and dim lighting and looked really appealing. The kind of place Don Draper and Roger Sterling would have after another hard day of lying on their office couches “working”. Our waiter was far too interested in pushing the Maggiano’s feel, “we’re a scratch kitchen which means everything is made from scratch…If you have food allergies, let us know and the chef will come out and talk to you.” We get it, this isn’t Olive Garden. Guess I won’t be bringing my Italian uncle to come eat here. They have a deal where you buy one bowl of pasta and you get another to go (it doesn’t have to be the same dish) for about $13. My lunch dish was eggplant parmesan, my favorite variety of parmesan. My to-go dish was spaghetti and meatballs. I’ve recently (in the past year) become a fan of meatballs after considering them kids’ food. The food came out and it looked fine. I was hungry so I cut my eggplant before I took a picture. That won’t be the last time that happens. The eggplant was flavorful, and the pasta was cooked well. Unfortunately the sauce suffered from chain style preparation. Not wanting to offend anyone with strong garlic, onion, or wine they just decide to walk behind the Morton Salt girl with their saucepan. There were no delicate or subtle flavors in the sauce like at North, and no strong old style red sauce comfort, just harsh tomato and salt. It just had no “love” or care in it, and I was left underwhelmed. While not overpriced for two meals, it would have been for one. Johnny Carino’s is a better deal with better food for chain Italian. Next time I’ll skip lunch and head straight for the bar. Chris Madrid’s is all that is right with San Antonio food. Visiting SA without hitting Chris Madrid's or Henry's Puffy Tacos can seem like a waste. Unfortunately I’m now past the age of being able to eat a “Macho”, and can only eat a regular sized burger if I want to be able to stay out of the hospital. The bun comes out shimmering with goodness from the grill. 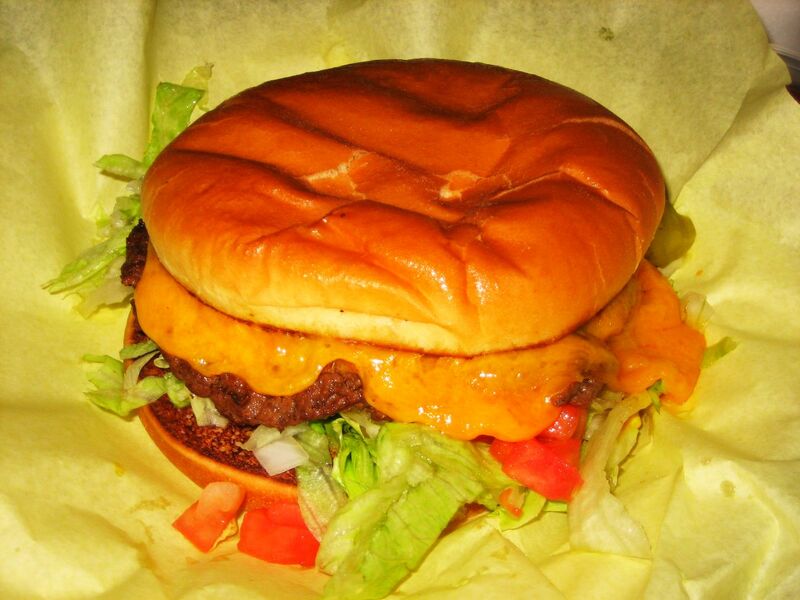 It sits on top of a wonderfully seasoned patty covered in melted cheddar cheese that has been adorned with shredded lettuce, diced tomatoes, onions, pickles, and yellow mustard. Of course like most food in SA, vegetables are ancillary to the discussion. I’ve tried many times at home to duplicate the seasonings of the patty, but have never come close to getting the mix right. I was particularly gluttonous on this trip. My aunt ordered nachos for our table of seven diners. Halfway through my Regular Cheddar Cheezy I noticed that no one had touched the nachos so I proceeded to stuff the nacho quarters into what was left of my burger creating my own Tostada Burger. My idea was inspired and terrible at the same time. Satisfied with my expanding waistline and constricting arteries I made the drive back home knowing that no burger in Austin can come even close to Chris Madrid’s. Then again, I've never had any burger better than Chris Madrid's. So about once a month, I like to have me a Weekend of Food -- all out gluttonizing, indulging to the point of inducing food comas, usually trying some place new. It makes me happy and gives me something to live for during the rest of the month. I like having things to read. I couldn't make up my mind between the Banana Cakes and the Banana French Toast (stuffed with dulce de leche). Hey, I like banana. 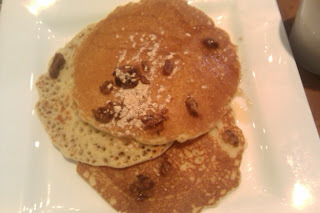 But with a name like Stax, how could I not order the pancakes, right? My banana cakes came with a macadamia nut crumble and were soooo good. Moist, the perfect density. Real maple syrup at the table, not that fake crap you get at some places. A sprinkling of powdered sugar. And the macadamia nuts added this perfect crunch that I wouldn't have thought necessary. On a scale of "how full of saliva was my mouth as I looked at that plate?" -- it was a 4 out of 5. Holes in the wall are always fun. You never know what you're gonna get, just like Forrest's momma said. When the cashier saw that me and my plus one were taking too long to read the menu, she asked, "Have you been here before?" "No," we said, smiling. She seemed annoyed as she called out to the owner, a man I instantly wanted to call Welito. He led us to a table and brought over a cemita (sesame seed bread) and what looked to me to be a flour tortilla gone wrong. He told us we weren't there to have tacos or quesadillas. We were only to have the place's specialty: the cemitas and the tacos arabe. 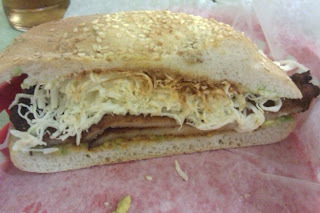 After he chastised Ray for not speaking Spanish, he gave us his dissertation on the cemita. The gist is this: It's made in Puebla. It's awesome. You gotta try it. I ordered the cemita with carne enchilada. It's a pork chop marinated in chile guajillo slapped between two pieces of cemita bread slathered in avocado, topped with adobo chipotle peppers and doused with an excessive spread of Oaxacan cheese. I was surprised by how much I enjoyed that sandwich. I wound up taking out some of the cheese. It was too much even for me, who snacks on cheese the way other people snack on nuts, but Oaxacan cheese is pretty bland. The marinade and the chipotle peppers really gave the sandwich a great flavor. Ray insists it was the best sandwich ever. I give it an A for avocado. The chalupas we had, which I ordered just for the hell of it, were sad. I could make those at home. Green sauce and red sauce over a tortilla with cheese? Please. The tortilla was soggy, too. This calls for a "PUES NO," (the Spanish equivalent of 'oh, hell no'). The next day I was in the mood for some cow on a bun. Chicago magazine recently did an issue that featured the "best burger" in the city. I've been trying to hit up the spots featured in that issue. I've knocked Hop Haus and DMK off the list, and since Kuma is impossible to get into, I went for Epic Burger, where the focus is on all-natural ingredients and eco-friendly packaging. Holy cow, that was an amazing burger. They offered the fried egg as an optional topping to the burger, but I'm still not down with that idea. Why's it so popular? I just don't get it. Probably goes back to my breakfast foods issues. I went the plain route: all natural epic burger with epic sauce, lettuce, tomato and pickle with fresh cut fries seasoned only with sea salt. 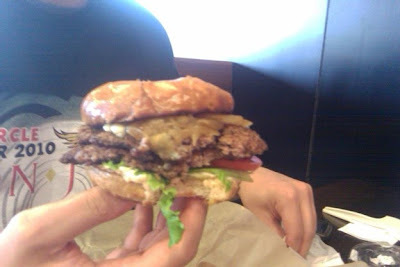 We have a winner for best burger in Chicago...Epic, by far. That night we tried this new brewery called Revolution Brewing. Tasty, tasty beer. My favorite was one called the Workingman Mild with hints of toffee and caramel. Man, I love toffee. 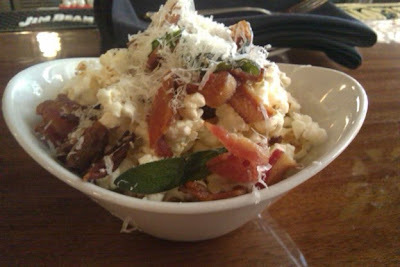 But what I couldn't get enough of was the bacon popcorn. THAT should be what people snack on instead of nuts. Yep, that's shaved parmesan up on top. Man, I drooled over that thing. Whoever invented that is a GENIUS. So, there you have it. My August weekend of food. You should join me for my next one! !